While parents are generally able to sign their children in and out using the Parent Kiosk, staff often need to use the Attendance feature to transfer students out of Before Care or into After Care. The transfer option also fantastic for keeping track of how long students are doing a particular activity, enrichment class, or in a transitory/temporary location. 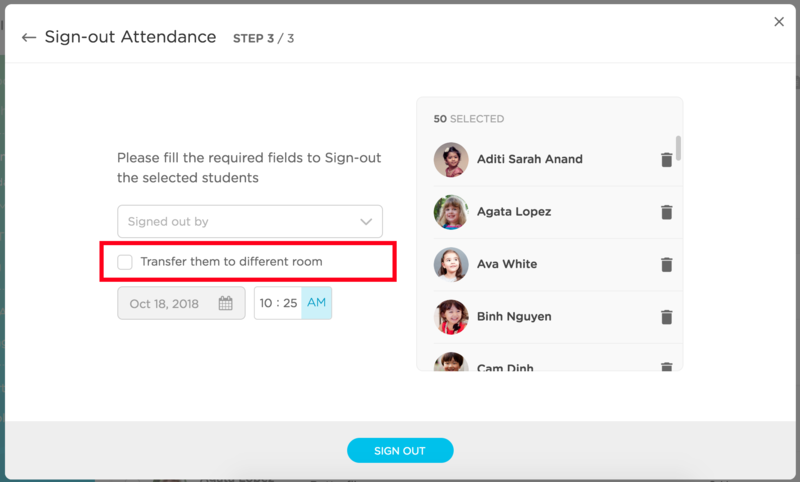 Go to Attendance and select "Signed In" children (see gif below). Optional: Filter by Rooms or Tags. Select students and click "More." Select the room, time, and staff member and toggle the "Transfer to a different room" button. 1. Go to Student Sign-In. 2. Click on the "Create Sign-In" button and select "Sign-Out Attendance." 3. Choose the children you would like to transfer. 4. Check the box for "Transfer to a different room." Select the room and adjust the time if necessary. 5. Click "Transfer" to save your changes. NOTE: You will need to set up Rooms so that students can be transferred accordingly.